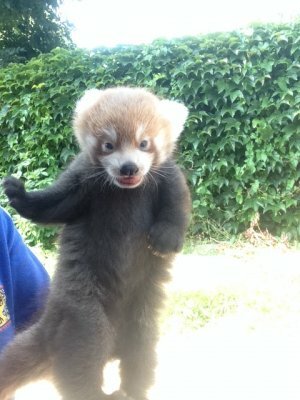 Welcome to our panda periodical; where we will keep you up to date with all the latest news about the progress of our new red panda twins born 16 June 2014. Since our last update the panda babies have been growing fast and have almost doubled in size! 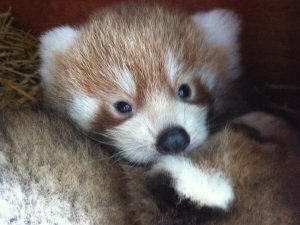 Red pandas are born with pale fur which darkens to the adults colouring around day 50. This is certainly true of our dynamic duo who are getting darker by the day, developing the distinctive red-brown coat and whitish facial markings of their parents. They are still being looked after in the nest box but are much more active now, exploring all the nooks and crannies. They are becoming very inquisitive about the world outside and are likely to start venturing out by the end of the month. However, for the time being, mum Mulan is keeping them safely inside. From time to time, Mulan can be seen moving the babies from one box to another. Red pandas are very clean animals and whilst they are being nursed, mum Mulan actually consumes all the waste products in order to keep the nest tidy. She will also move the family between nest boxes to ensure the conditions are just right, transporting the twins to a more shady area on hotter days. Some of our visitors have been lucky enough to capture this process on camera. The image below was taken by Liza Weller and shows Mulan carefully carrying one of the cubs between nest box 2 and 3. The babies are getting so big now Mulan will not be able to do this much longer. The arrival of the new babies has also received a lot of interest and some very generous donations. 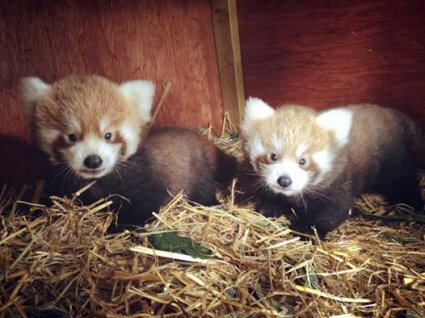 On 18 July, Suffolk based property management company, Home from Home undertook a 250 mile round trip to donate large quantities of bamboo to the red pandas in time for their tea. Plus students from Verdala International School in Malta raised money and made a generous donation to our red pandas after news of their arrival spread internationally. We would like to extend our thanks to both of them.